This unique and practical rail has been designed in conjunction with Physiotherapists, Occupational Therapists and Manual Handling Advisors. The rail is designed to provide support when navigating steps up to the door of a house and is suitable for use on step inclines from one to four steps. 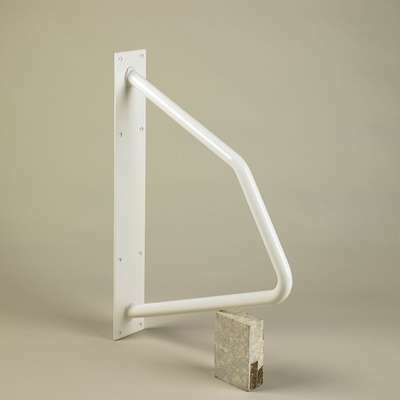 Designed to replace permanent rails with concreted in posts, reducing installation time significantly. The rail can be installed either way round to suit different step inclines. Can also be used to provide support at the side of a toilet or wash basin. I should have had an email to say there was a delay, and waiting for new supply, otherwise very pleased with grab rail. Just took too long to arrive, I did get an apology from Julie Thank you Alan. Good, sturdy rail which does the job well. Slight delay in delivery but kept well informed by staff. Great product that my customer is over the moon with. Installation was simple and they provide a really firm hand hold to assist with climbing the entrance steps. Delivery was quick and items well packaged. Product is fine but at this price I expected screws and plugs to be provided. Item clearly illustrated and described. Priced as stated. Delivered in very short time and completely satisfactory. Fitted and in use within 3 days of placing order. I call that Deluxe trading. Nice and solid, well made. It was exactly what we wanted and mother in law feels safer going down her stapes with it in place. Nice and strong, and makes me feel secure. This grab rail is a great boon for someone with arthritis and/or unsteady on their feet, so pleased I ordered a second one, thanks. A pleasure to deal with. Fast delivery with reasonable price. Thank you. Good strong and clean result after installation into brick. Used 6mmx 60 de Walt coach bolts in all 8 holes to be sure. Very strong grab rail . Very robust, sturdy & versatile. 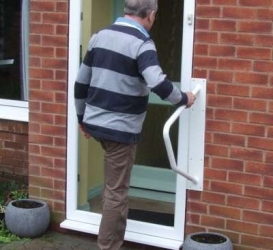 I ordered 2 for my elderly mother in law's access through a patio door to her garden and for her kitchen door entrance. She loves them and is now confident to get outdoors on her own. Simply to fix but make sure you use substantial screws and rawlplugs to ensure the rail is held securely. Paul W.